In honor of Earth Day this Sunday, I thought it would be good to give five simple suggestions on how to live a wee bit greener life. These suggestions really aren’t difficult, you’ve probably heard them a million times already, but humor me and hear them again. Decreasing your impact on the planet doesn’t necessarily require you to spend heaps of money or to put up a wind farm in your back yard; it’s about breaking old bad habits, and creating new ones that are a little easier on our wallets and less stressful on our planet. #1. Unplug. If it doesn’t need to be plugged in, unplug it. Even if you shut down your menagerie of electronics, chances are they’re still drawing power just by being plugged in. Huffington Post provided an article in HowStuffWorks to explain that standby power consumption could account for 5-10% of your total electric consumption. Combined with everyone else’s standby power consumption, this equates to about 1% of worldwide carbon dioxide emissions. Granted, it’s a little frustrating when you’re first getting started to realize your toast is not in fact toasting because the toaster’s been unplugged since last Tuesday, but after a few mishaps you’ll remember (hopefully) to check first, then unplug when you’re done. If things do need to be plugged in, consider changing power saving settings or sleep settings, or go big and invest in a smart strip which shuts off power to electronics in standby mode. #2. Turn Off. Growing up, I wasn’t a fan of the dark. If my parents left me home alone they would return to find every light on in the house. Now that I live on my own, I’ve become a bit neurotic about turning off lights–I find myself residing half the time in semi-darkness with only one CFL light bulb burning in the corner. As this probably isn’t most people’s style, just be conscious of the fact there isn’t a little elf that lives in your room that needs the light on after you walk out. If you’re at work, school, what have you, make sure you’re heater or air conditioner isn’t running full speed ahead while no one is home. #3. Reusables. I’ve used some form of a reusable bottle since high school. 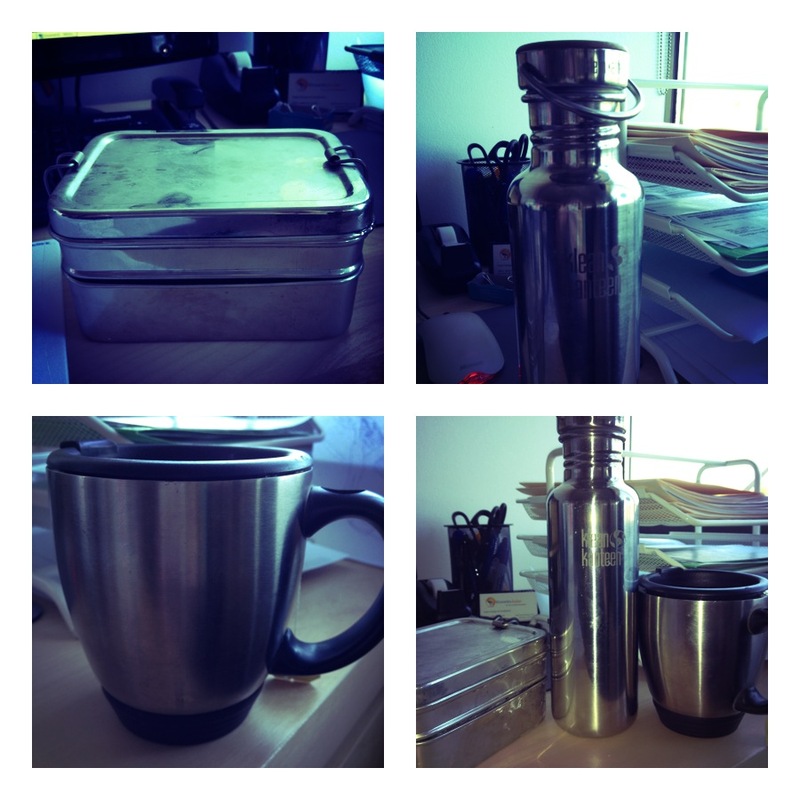 When I started working, I got in the habit of making my tea or coffee at home and bringing it in a mug. I do cheat on Fridays when I reward my hard work for the week with a triple soy latte from the coffee shop down the street, but now that I think of it, they probably wouldn’t be opposed to putting my caffeine addiction in my mug. In an effort to save money, I bring lunch from home, but after a few months I was going through a foolish amount of plastic ziplock baggies! I decided to cut the baggies out of my lunch life and got an Eco Lunchbox. This little bento style box fits my sandwich, and a good couple of snacks for the day. Some cities in California have recently instituted plastic bag bans, but if yours hasn’t jumped on the bandwagon, invest all .99 cents most reusable bags cost and bring them when you go to the store. If you’re like me and realize halfway to the store you have no canvass bags, stash some in the trunk of your car. Plastic is a huge source of waste in the U.S. It comprises of 12% of our waste, 27 million tons of which ended up in landfills in 2005, according to Time. #4. Buy Local. Buy Organic. Food travels extraordinary distances to get to your table. Not only does this mean you’re probably not getting the highest quality or freshest produce, but it has serious implications for the climate in terms of energy consumption and emissions released. According to a Health Facts article by the NRDC, imports of fruits, nuts, and vegetables in 2005 released more than 70,000 tons of carbon dioxide, that amount is equivalent to 12,000 cars on the road. Buying local helps your local economy. Buying organic means no pesticides or fertilizers tainting your food, bringing better quality produce to your table. Bring your recently acquired reusable bag to your local farmers market this weekend! #5. Turn Off the Tap. If you leave the water on when you’re brushing your teeth, and you brush your teeth twice a day, you’ve just wasted 24 gallons of water. Everyone likes a long, hot shower after a rough day (myself included). Most shower heads use 2.5 gallons of water per minute. If you usually shower for 20 minutes, you’ve lost 50 gallons of water, not to mention the energy it takes to heat that water. Try cutting your showers down by 5-10 minutes a day. Personally, I know I waste the most water when I’m doing dishes–I’ve developed the bad habit of leaving the faucet running while I scrub my Eco lunchbox clean. I’m contemplating putting a post-it on the wall behind the sink reminding me to turn of the tap when I’m scrubbing. If you do your dishes in a dishwasher, make sure you’re running full loads. These suggestions are kind of no-brainers. Like I said, it’s about breaking out of our wasteful mindsets and creating new, contentious habits that we practice in our daily lives to help lower our impact. I don’t know about where you live, but when I filled up this morning I paid over $4 dollars a gallon for gas. And not just a couple cents over mind you. I’ve recently read some interesting articles revolving around gas prices. Specifically, about high gas prices and what a president can actually do about lowering them, which turns out to be not a whole lot. With that being said, it may be a little confusing to some why Newt Gingrich is on his soap box promising gas prices to be $2.50 a gallon (or lower) if he’s elected president. Aside from the fact that his name is Newt and he looks like a goblin, I don’t know if that’s a statement I’m readily willing to believe. When Obama took office, we were scoring gas at about $1.81 a gallon. We were also in the clutches of the worst global recession since the Great Depression. The recession depressed demand; less people were driving and costs went down. As the economy started chugging along once more, the price of gas rose. If Newt is able to deliver on his $2.50/gallon prices, there’s a good chance that means the economy has gone down the poop-shoot. Under Obama (and his “all of the above” energy strategy), domestic drilling is booming and we’re importing less oil than we have in years, but as oil functions on a global market, domestic drilling doesn’t necessarily equal lower gas prices. For presidential candidates like Newt who are singing to the chorus of “drill baby, drill” –that won’t lower gas prices. For those who might already be skipping towards Blame Road and Keystone Pipeline Lane, Obama’s blockage of the oil pipeline is not causing the high price of gas. In fact, Keystone would have little immediate effect on gas prices, and on a long term would probably only lower prices a few cents–maybe. Gas prices are higher is because the economy is doing better, driving up the demand for gas. And with tensions and uncertainties in the Middle East, in addition to countries like China who are anticipated to use 5% more gas this year, prices will continue to rise. It’s going to take more than drilling to solve our energy problems. An overall energy efficient economy will help make us more resilient to high costs and price spikes. Hopefully the American people realize that when voting time comes. Germany’s on the war path to be the most accomplished practitioner of renewable energy. They’re not only thinking of ways to become less reliant on fossil fuels, but actually implementing them (a novel concept, right?). The Efficiency House Plus is a prototype unveiled by officials in Berlin. This home isn’t only built from recycled materials, but is energy-efficient, and self-sustaining–complete with an electric charging station for EVs. A family of volunteers will be chosen to stay in the house for 15 months to show that energy efficient, sustainable homes can (and do) exist in real world applications. The first goal of this sustainable house is to produce twice as much energy needed by a family of four. The average American household uses about 958 kilowatt hours per month (11,496 kWh/year), according to the Energy Information Administration. Since the general Germany population seems to be more energy conscious, I’m going to guesstimate their energy usage at about 583 kilowatt hours per month (~7,000 kWh/year). At 14,000 kWh a year, the house can produce even more energy than used by the average American household! There is a second underlying goal which I think is important to point out, and that is that the house uses solar, as well as energy management techniques to not only power the house, but provide enough energy for EVs, or to be sold back to the grid. Solar and energy management strategies aren’t new concepts–it’s important to show people that the technology to achieve a sustainable house is readily available to put in to practice now. It’s already possible to live like this; it’s not a Utopian dream of the future. The Efficiency House Plus will set the bar for efficiency measures that can be implemented by the masses. 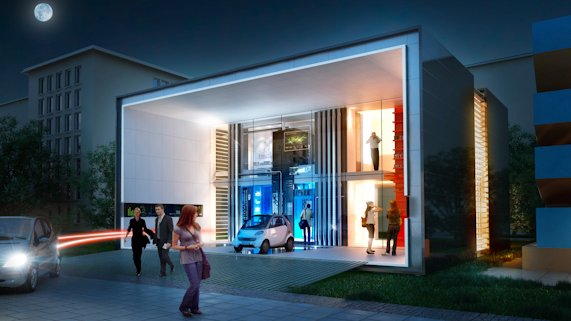 The Efficiency House Plus not only has charging stations, but the volunteer family will be able to drive an EV from Germany’s four leading car manufactures (including Audi and BMW) for three months each. As the Federal Minister of Building, Dr Peter Ramsauer, put it they’re keeping with the idea, ‘my home is my filling station’. With such strong support from auto manufacturers, the government, and the public, the Energy Efficiency House Plus will indeed meet the “fuel” needs of the EVs and the home’s energy needs, while showing the world that energy efficient homes can do more than be a topic of conversation; they can produce enough energy for our vehicles and potentially enough energy to return to the general grid. In the previous post, I mentioned how important cooperation is to achieve renewable energy goals, and The Efficiency House Plus shows once again, that Germany has a knack for getting things done, even while juggling political, industry, and public interests. And who wouldn’t want a house that could power your car?